Lexie is currently a Junior at Covington High School. She is a 3 year member of the Dancin' Darlins' and also holds the position of Co-captain.She is also a Student Council Representative for the Foreign Language club. She participated in the PTSA Reflections contest and recieved Honorable Mention at the national level. 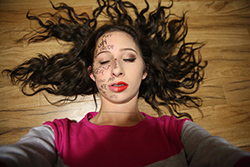 She is currently enrolled in Mr. Lynch's Webmastering class and plans to further her knowledge in photography as well. For the current year, she plans to become certified in Dreamweaver. The theme was "What Is Your Story?" for the 2017 PTSA Reflections contest, and Lexie won with this photo!